Johannesburg is all those things big cities are: Busy, big, mad, bad, mixed and moneyed. If not moneyed then on the constant overhaul and remix of the hustle and grind. When I was back I stayed in the Vodacom building, or Ponte as locals know it. Ponte Tower is at the edge of Hillbrow. Yes, Hillbrow: suburb of sin as international news agencies would have you believe. Regularly, it’s just a neighborhood where families stay. There’s good food, fresh fruit and everything else you can buy on the street. It’s close to the main arterials of taxi routes and has Joubert Park and the Johannesburg Art Gallery (free entry) at its edge. In short, people are living here. They are not thugs, they are not thieves (okay maybe a few), most are simply trying to get their kids to school and themselves to work and are the people of that great city, Johannesburg. Don’t get me wrong, it’s hard not to get excited about change in Johannesburg’s CBD, to laud the opening up of a space in which to stake a claim in the burgeoning new turn this city will take. But for Dr. Ella Manga to say, “For me Maboneng really represents the future of South Africa. It’s how we all want to live. It’s the way we should be living” in the context of what I’d just seen in this documentary made me balk. Not because I don’t want to live in the centre of town and be a part of everything that Joburg has to offer but because of the way this intersection between the individual and the city is presented by the Maboneng ‘regeneration project’ (gentrification is too suitable and honest a word). In Maboneng this intersection is a strictly curated experience that takes place along clearly delineated class lines. Class lines that keep some in and most others out. A curated space, this Maboneng: even the ghettoized image of the old-school boxer is included for added street value and is allowed into the space so that the residents feel they’re at the cutting edge. I think it’s worth asking whether George Khosi was also offered residential space inside Maboneng and not just the rooftop for training? 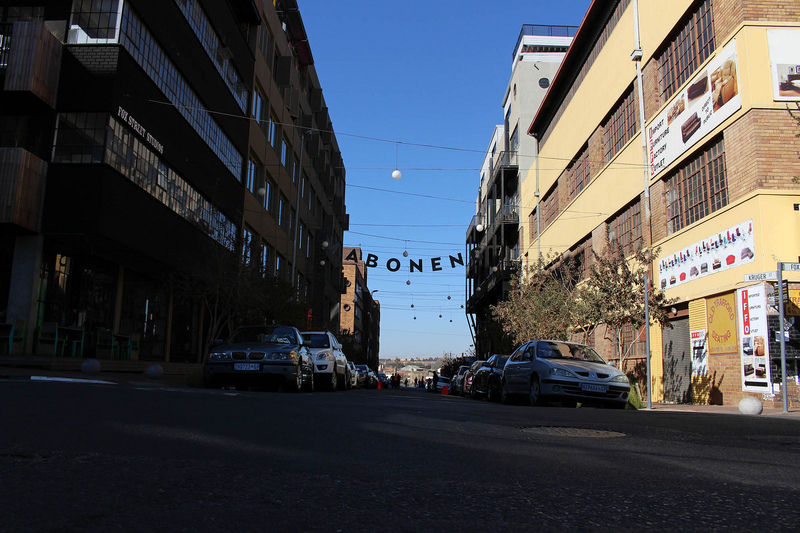 A space kept closely cordoned off to the everyday passerby, curated and spearheaded by developer Jonathan Liebman, where even visitors to Maboneng act as the neighborhood watch. Criminal elements are not welcome. People in the street if they see someone they don’t like they’ll come in and tell us: there’s somebody here that we don’t like, won’t you go and see or call the police or do something. The criminals find they’re not comfortable so they leave. Yes, granted. We are changed when we move to the city, when we take a chance on our dreams in a place that affords us the space and the opportunity to do so. But let’s not forget we don’t live in a bubble. It’s not just our dreams that exist inside that primal, transitioning space of the city. Others make a way here too. Their striving deserves as much recognition as ours. So go to the local lunch place, get your haircut inside the makeshift barbershop and buy your milk at the babbie (bodega). If anything, you will find yourself discovering more of the city there than you will inside the small confines of Maboneng.